October 12, 2018 – Lamacchia Realty is proud to now be a sponsor of the Worcester Railers for the 2018-2019 Season. Through the sponsorship and advertising at games, the Company is excited to be a part of the Railers fanbase and success. Lamacchia Realty is excited to offer agents, staff, and client’s tickets to games to enjoy the fun together! As part of our promotions and agreement with the Railers, Lamacchia will offer the “Lamacchia Best Seats in the house”. The Best Seats in the House will be two big sofa chairs that will be right above the boards on the corner of the ice on their own custom-built spacious platform. These seats include their own personal food and drink service. This promotion and the winners of the drawing that will be taken at the end of the first period of each game and will get to enjoy the seats with a waiter to serve them for the rest of the game! The Worcester Railers have been such a strong attraction in the Worcester area and has provided support and service to the community, and Lamacchia Realty is proud to give back and support the team. Lamacchia Realty has been selling homes in Worcester and surrounding communities all over Worcester County since 2008 and has grown in the Worcester market from the original two local realtors in the beginning to over 30 and counting. 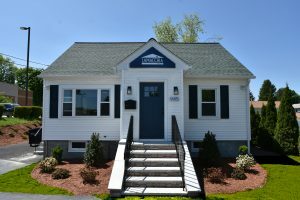 With the continual increase in agent count, the company was thrilled to offer a state of the art, newly renovated facility for their Worcester county clients and agents which opened in late June of this year. Lamacchia Realty realtors provide exceptional service while implementing the innovative strategies they learn from the company’s REAL training program. Lamacchia Realty’s mission is to provide industry-leading training, support, systems, and technology to its agents and employees so they can reach their fullest potential. Agents who join Lamacchia grow their business on average by 318% in their first twelve months. In 2017, Lamacchia Realty also made Inc.’s 2017 List of 5,000 Fastest Growing Companies in America for the 6th time in a row and was named Honoree in the 2017 Inc. Magazine’s Best Workplaces Contest. In 2018, Lamacchia received recognition from the Boston Business Journal Fast 50 as one of the fastest growing private companies in America, by REAL Trends on their list of Largest Privately Owned Independent Companies in the U.S., and received the Leading Real Estate Companies of the World Fast Tracker Award.